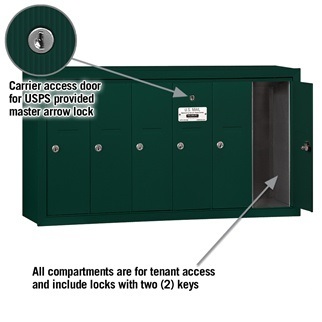 Vertical mailbox door size is 5 1/2"W x 16 1/4"H.
Each mailbox door includes a five pin cylinder cam lock with two keys and a 2 1/2"W x 5/8" identification to accommodate a label (included) to identify tenant's name or unit number. Each vertical mailbox compartment is 6 3/4"D.
Units are ideal for apartments, condos, commercial buildings, and other commercial applications. 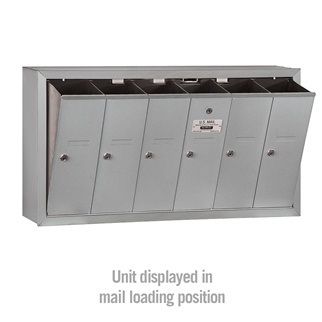 Vertical mailboxes are considered USPS 4B+ Compliant. USPS 4B+ compliant mailboxes are USPS approved for replacement purposes only. (NO EXTRA CHARGE FOR FINISH CHOICES) Finish choices available for vertical mailboxes are aluminum, brass, bronze, green, or sandstone powder coat. 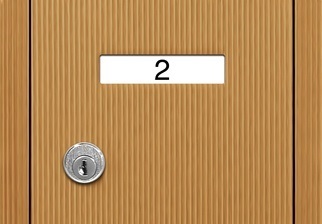 (STANDARD) Surface mounted vertical mailboxes attach to the surface of the wall with a mounting collar. 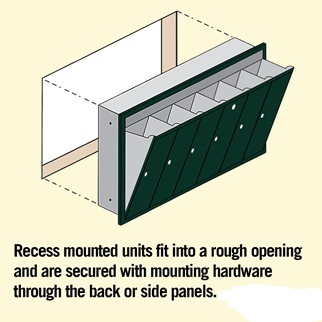 (NO EXTRA COST) Recessed mount vertical mail receptacles install into a wall. (STANDARD) USPS access vertical mailboxes have the top middle door in each mailbox cluster prepared for the postal arrow lock. The USPS typically will install their arrow (master) lock at your location at no charge. (+$30.00) Private access vertical mailboxes come equipped with a commercial lock for master access for the person designated for distributing information into the different storage compartments. 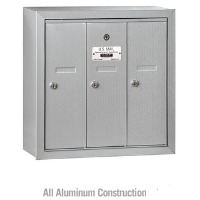 Private access vertical mailboxes are not used for U.S. Mail delivery.